It is no secret that I adore the pets who share my house, nor is it privileged information that my constant companion is Pippa, my wonderful hound. A man who shared my love of dogs is, of course, William Hogarth, the legendary painter who, like my sister, shared his home with a pug. Hogarth's pug went by the name of Trump and it's fair to say that he was a celebrity in his own right, with small porcelain figures of Trump being sold to Hogarth's fans, whilst the painter himself was on occasion depicted as a pug too! 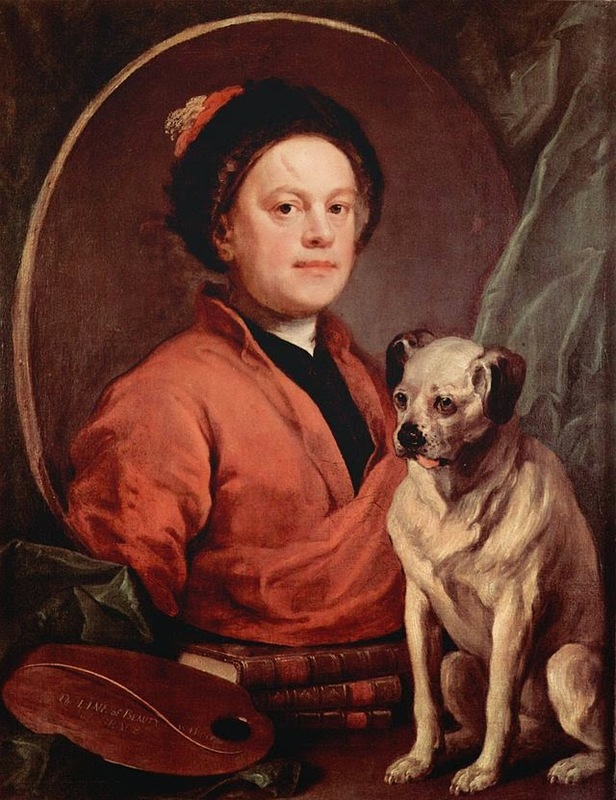 In the 1730s, Hogarth began work on what would become The Painter and his Pug. The work depicts Hogarth as a picture within a frame whilst Trump sits outside it, reality alongside the constructed and framed image of Hogarth. Although the finished portrait shows Hogarth in informal dress, initial work on the canvas showed a very different figure, with the artist resplendent in wig and formal dress. Clearly Hogarth had a rethink though and chose to depict himself as a craftsman, rather than a figure of wealth and importance. He has taken great care over other aspects of the painting too, as the self-portrait rests atop a bile of books by Milton, Swift and Shakespeare, whilst the palette in the foreground bears the words, "Line of Beauty and Grace". Although Hogarth painted out "and Grace", over time it has become visible again and this refers to Hogarth's artistic beliefs set out in his work, The Analysis of Beauty. The Painter and his Pug was completed in 1745, a decade or so after work on it began. As a dog-lover, it is a painting that immediately speaks to me because of the way in which Trump is presented, obediently sitting before his master alongside the books, palette and words that mean so much to the artist. He is a vital part of Hogarth's life and art, as much a part of his inspiration as the literature on which Hogarth's portrait rests. Trump would not be the only pug owned by William Hogarth but his place in history is assured, captured forever in this striking work. One of my favourite characters,Madame-and I know of yours as well. My book on Chiswick has many photos and references to the Hogarths and their house. A very interesting couple-especially with all the work they did for the Orphanage?. Oh yes; what's the title of the book?